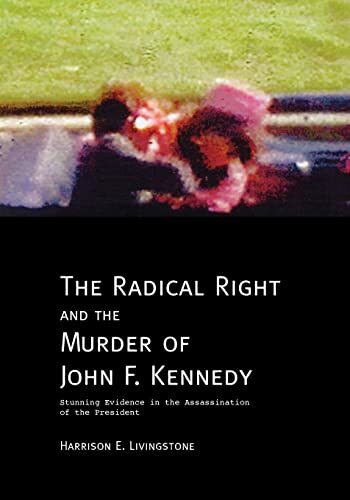 This book brings together all the principal evidence demonstrating conspiracy in the assassination of President Kennedy and shows the linkage to radical U.S. Rightists. Harrison Livingstone, a great admirer of President Kennedy, traveled to Dallas in December, 1963, and took a room near the Dealey Plaza. While studying the ground where JFK was shot, he met Penn Jones, Jr., a combat veteran and colonel at the Anzio beachhead and other famous battles in Italy during World War II, and Jones showed Livingstone both storm drains on and near the triple railroad overpass that the fatal limousine headed towards when th shots rang out. "This is where the shots came from," Jones said. Livingstone began an extraordinary investigation to find out if this was true or untrue, and found powerful evidence to support such a conspiracy. Along with the discovery of the forgery of the autopsy evidence. Not long after, the south drain over Commerce Street was paved over when the parking lot was extended. Livingstone has researched the case ever since, producing six major books (three of them are bestsellers) on the case with a specialty in the medical evidence. His published articles would fill a seventh book. At times his investigative team involved nearly 100 people spanning the nation. In 1979, he was the first person to show copies of the autopsy photographs to the Dallas doctors and nurses and elicited their responses which Penn Jones published. The Dallas medical witnesses uniformly denounced the pictures as not representing the wounds they saw. This startling finding has been substantiated by major government investigations involving the autopsy doctors, photographers, corpsmen, and the FBI agents present, as well as the other researchers, presented in his previous books. His work changed the entire course of the investigation. Questions about the credibility of the medical and photographic evidence were a great taboo, and he had to overcome the "gatekeepers" in whose agenda was to insist that the medical and photographic evidence was authentic, whereas Mr. Livingstone held that (like the evidence against Lee Harvey Oswald), it was fabricated. "All of the evidence in the case is false!" he says. His task was to prove it, and that he did in his first four books. He is considered the principal researcher, investigator and write in the case, with several bestsellers to his credit. He had suspicions for many years about the Zapruder film and those who placed great credibility in it, but "it was very difficult to find something to hang one's hat on" he says. Slowly, the picture came together and he developed powerful evidence of the falsification of even that famous film, presented in companion volume to this book: The Hoax of the Century: Decoding the Forgery of the Zapruder Film. Mr Livingstone writes novels, short stories, plays and films. He has written a ballet film for children and their families, historical dramas about Cortes, Hitler, and the entire American Revolution, and an Elizabethan bawdy comedy. With roots on both coasts of the U.S., he lives in California.